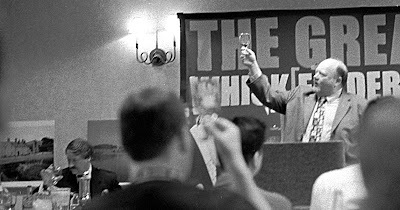 On Tuesday, October 23, WhiskyFest comes to San Francisco for the first time. Attendees will have the chance to sample some of over 200 of the worlds finest whiskies. The whisky list includes Springbank Rum Cask, Aberfeldy, Bruichladdich, The Dalmore, Sazerac Rye, Ardbeg and many many more. If this wasn't reason enough to attend, a host of educational seminars are planned. All the seminars look very good, but one seminar promises to be particularly enlightening. The Dalmore Master Blender, Richard Paterson and someone called Fred Noe plan to have a well-reasoned and civilized discussion on the relative merits of Scotland's finest malt whiskies as compared to some various types of American "Corn Likker." he knows just about everything about whiskey and is a passionate and knowledgeable history buff as well. Richard is entertaining, educational and an all-around asset to the whisky industry. 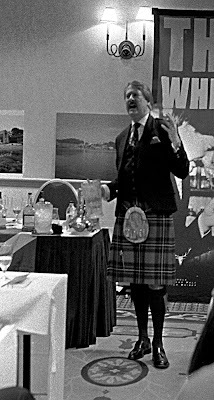 Richard Paterson discusses the finer points of Scotland's Whiskies. Fred Noe will be talking about various types of American Corn Whiskey. Fred Noe discusses the produce of barefoot hillbillies. Tickets and more information at The Malt Advocate.